Walschaerts valve gear, photoed at Swanage 26 May 2009. One of 55 of her class, Oliver Cromwell was built at Crewe Works, being completed on 30 May 1951. Initially allocated to Norwich depot (32A), she remained there until 1963 when she was transferred to Carlisle Kingmoor TMD. Steam in East Anglia ended in 1965, after which the north-west of England became the steam locomotive's last stand. 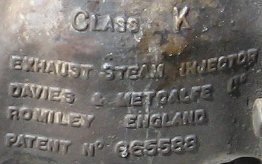 On 3 October 1967 she entered Crewe Works and became the last BR-owned steam locomotive to undergo routine heavy overhaul. She was selected to operate the last steam passenger train prior to the abolition of steam traction and in the summer of 1968. Oliver Cromwell hauled several specials, culminating in the Fifteen Guinea Special which was hauled between Liverpool and Carlisle of 11 August that year. 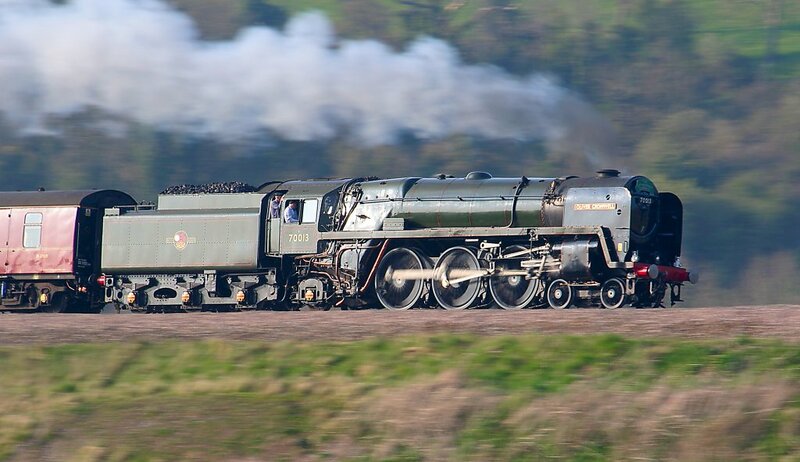 Oliver Cromwell became part of the National Railway Museum's National Collection immediately after the end of the Fifteen Guinea Special (70000 Britannia (later preserved privately) had previously been earmarked for this move). Despite a steam ban after the 11 August 1968, 70013 moved under her own steam on 12 August to her old shed at Norwich and then on 13 August to Diss where she was transported to Bressingham Steam & Gardens. 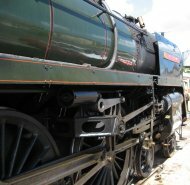 At Bressingham, she was in service to provide footplate rides till the 1980s, before retiring into the museum exhibition. 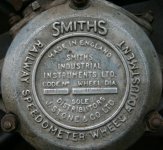 In 2004, it was announced that Oliver Cromwell would be restored to main line standard in preparation for the 40th anniversary of the end of steam. The locomotive was overhauled at the Great Central Railway (GCR) with a view to hauling trains both on the Great Central and specials on the main line. On the weekend of the 3 May - 4 May 2008, the locomotive hauled its first revenue-earning passenger services on the GCR's eight-mile route. The locomotive made an appearance at the National Railway Museum's "1968 and All That" event celebrating 40 years since the end of steam. Its first mainline passenger charter since 1968 was on August 10 2008 when the locomotive took part in a re-run of the Fifteen Guinea Special. It then went on to operate on the Scarborough Spa Express later in the month. On the 9th September 2008 Oliver Cromwell completed a re-run of "The Norfolkman" running from Liverpool Street station to Norwich railway station and return, visiting the site of its former home of Norwich shed (32A). 70013 carried a 32A shed plate on the smokebox to complete the image. 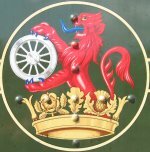 On 8 November 2008, the locomotive was temporarily re-numbered as 70048 and re-named "The Territorial Army 1908 - 2008" to commemorate the 100th anniversary of the Territorial Army. 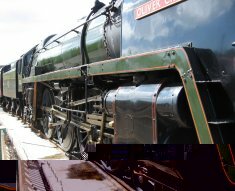 The naming was performed by HRH The Duke of Gloucester at Quorn station on the preserved Great Central Railway. 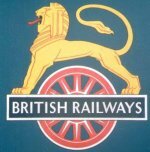 70048 was a sister member of the BR Standard Class 7 Britannia class and was named "The Territorial Army 1908 - 1958". 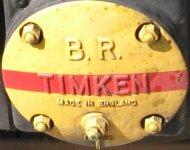 During the 2008 re-naming, 70013 carried this name on the right hand side smoke deflector as a reminder of the original name and as a link with the past association with the Territorial Army. 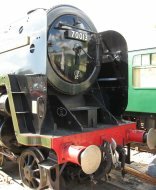 On 23 May 2009, the locomotive hauled a railtour from Norwich to Poole in Dorset, and then travelled to the Swanage Railway under its own power via Wareham and the reinstated link between the main line and the Swanage Railway at Motala. Compiled, hand coded and copyright © 2009, John Palmer, All Rights Reserved.